Do you need to protect your little one from the sharp edges of your tables? Then the All Care Baby corner protector set is everything you've been looking for and more. When your baby starts crawling and walking, you need to make sure that your home is a safe space for your little one to explore. With these premium furniture bumpers you can rest assured that your child will never fall on the sharp corners of your furniture, so it can stay perfectly safe. The corner protector is very dense yet soft so it can make any table and desk sharp edge-free and safe. The corner guard and furniture bumpers are crafted to perfection with special attention to detail for flawless results. They are very durable and incredibly soft for perfect safety and maximum performance. 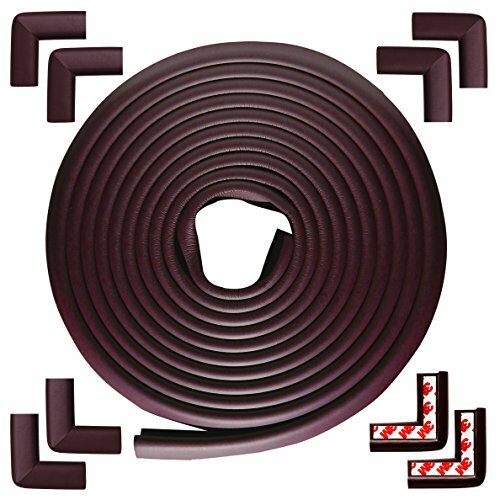 We provide you with 8 pre-taped corner furniture bumpers that are very easy to install and can perfectly fit any table, desk, countertop and shelf corner. The sharp edge protector roll is also very easy to use and very long, so you can cut it to any size you want, tape it, and adjust its shape on any piece of furniture. The corner cushion comes in brown, so it can fully blend in with your wooden furniture and keep your little one safe while matching your home decoration. We provide you with a 30-day guarantee, so there is no risk. Just give our product a try and if you are not completely satisfied we will give you a full refund. If you have any questions about this product by All Care Baby, contact us by completing and submitting the form below. If you are looking for a specif part number, please include it with your message.